Untethered jailbreak is in our hands thanks to the team of evad3ts who created the evasi0n tool to jailbreak iPhone, iPad and iPod Touch on iOS 6.1 / 6.0.1 and iOS 6.0 firmware. Well, those looking to unlock their phones can follow the guide below and use SAM unlock activation tickets to unlock iPhone 4, 4S and iPhone 3GS on iOS 6.1 firmware. The tutorial is going to teach you how to unlock your iPhone on iOS 6.1 using SAM activation tickets. This is for all iOS firmwares that start from iOS 6.0 and go up to iOS 6.1.1. This means iOS 6.0.1 is also included. Make sure you read these important notes first. 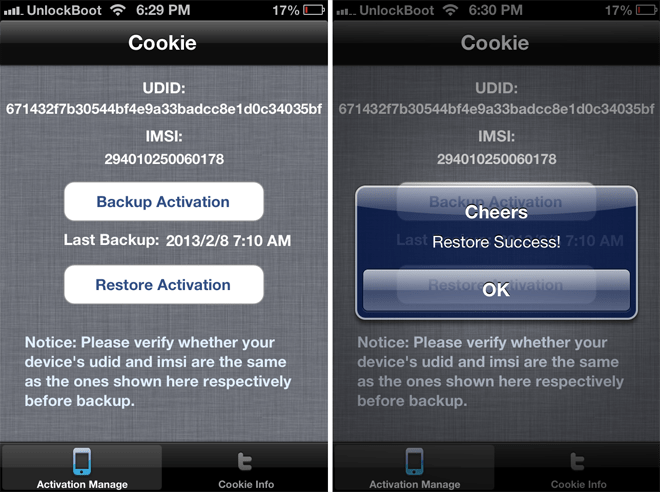 Use the ‘Cookie’ app from Cydia to back up your SAM activation tickets. The guide works on iOS firmwares iOS 6.0-6.1. The guide will work only for those who have SAM activation tickets saved. Use the SIM Card that was first used when you backed up activation tickets. The guide is useless for people who fail to realize the importance of this step. If you don’t understand this method, wait for the iPhone Dev Team to release readsn0w to untether jailbreak IOS 6.1, which will make the process automatic. The guide works on all iPhone basebands expect the iPhone 5. SAM unlock activation tickets should be backed up. Original SIM card that was used when saving SAM activation tickets. 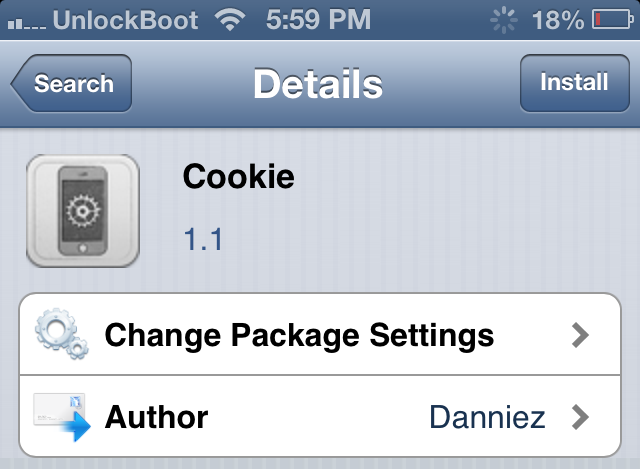 Step one: Launch Cydia, search for Cookie and install it. Step three: After inserting unofficial sim, wait for a few seconds, press “Restore Activation”, Confirm, wait for a while, you should see signal bars. You’re done. 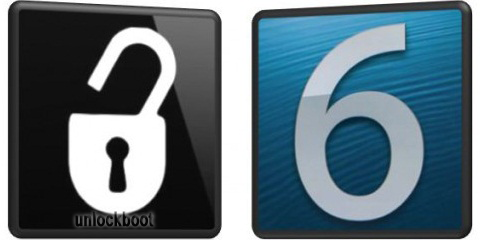 Your iPhone is now unlocked with sam unlock activation tickets on iOS 6.1 / 6.0.1 firmware. Step one: Open Cydia and Install SAM. Step two: Revert Lockdown to stock. Step three: Replace your backup ticket files (Lockdown folder) to this location: /var/root/Library/Lockdown. Step four: Reboot your phone. Step five: Open Sam tool and tap Disable. Step six: Reboot again, and wait for signal bars. Cheers! Your phone can be used with your unofficial SIM card on newest Apple iOS 6.1 firmware. Enjoy your phone. What to do if Your Phone Can’t be Unlocked With This Method? Are others out of luck? Not really. There is a factory unlock solution that works on all iPhone basebands and doesn’t even require a jailbreak. The basebands supported are old and new. However, the carrier of the device should be figured out first. The next step is to find out the device eligibility for the unlock. Lastly, go to Settings -> General -> About to find the IMEI number for the device. After all this has been done, the user is going to receive a mail from the company, which will allow the unlock, and there won’t be any need to worry about a re-lock in future basebands and firmware updates. There are many services that claim to do this, but our recommendation is the most reliable and comes with the lowest cost. They can unlock Rogers, Vodafone, Fido, O2, T-Mobile, Verizon, AT&T and other famous carriers. Now you can unlock iPhone 3G, 3GS, 4, 4S and 5 through the website right here.